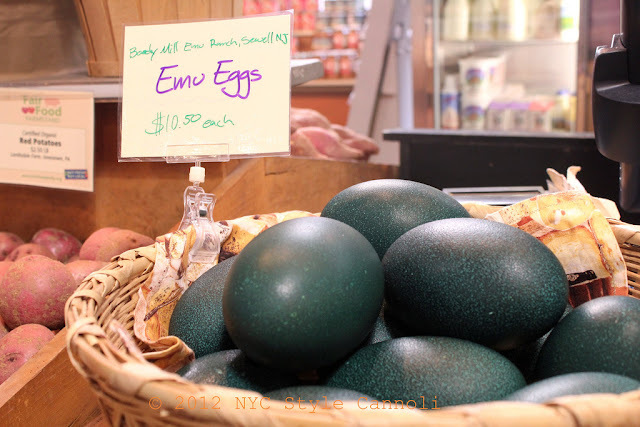 Photo Gallery Thursday " Emu Eggs"
Yes, it says Emu Eggs....caught my eye at the Reading Terminal Market while visiting the flower show. They were very big and a gorgeous color. I found some great information on them HERE along with a comparison with the chicken egg. Big Difference. What a unique item, so glad I was able to see them at the market. Have you ever had an Emu Egg? That is an interesting article on Emu eggs. It would be fun to see what they taste like. Your blog is very very interesting!